Ever dream of selling your house, taking a sabbatical from your job, and moving to beautiful Paris? Best-selling author Eloisa James did just that. Her enchanting memoir, Paris in Love, chronicles her year in the City of Light. 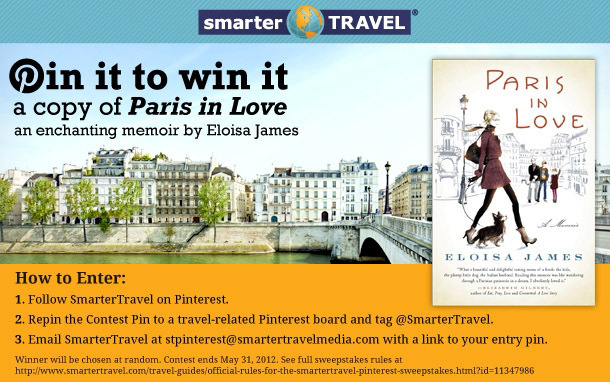 Repin the Contest Pin above (or pin it from this page) to a travel-related board and tag @SmarterTravel. Email a link to your entry pin to stpinterest@smartertravelmedia.com. A winner will be chosen at random on May 31. Find the official rules and conditions here. If you haven’t already joined Pinterest, email stpinterest@smartertravelmedia.com with a request for an invitation. Update: This contest has ended. Congratulations to Amanda B., the winner of our Pinterest sweepstakes!